White hair is usually associated with old age. But now even teenagers are seen with a few strands of white hair. This can cause a lot of anxiety in young people. However, there are home remedies to deal with premature hair whitening. Biotin is a natural ingredient and it is very effective for maintaining the black colour of your hair. So, make sure that you eat foods rich in biotin regularly to get rid of white hair at young age. Oats and almonds are rich sources of biotin. You can also use hair care products containing biotin to restore the black colour of your hair. One easy way to prevent whitening of hair is to consume food rich in Vitamin B12. It also helps in curing your already white hair. Vitamin B12 helps in maintaining the health of the scalp and heals hair against whitening. Have fresh fruits and vegetables that are rich sources of this vitamin, like yeast, oranges, avocados, cheese, cranberry, plums and so on. Soon you will start getting positive results. It is also good for promoting hair growth. The new hair strands overshadow the white strands, which fall away finally. Stress is one of the main reasons for the harm done to our hair, skin and health. 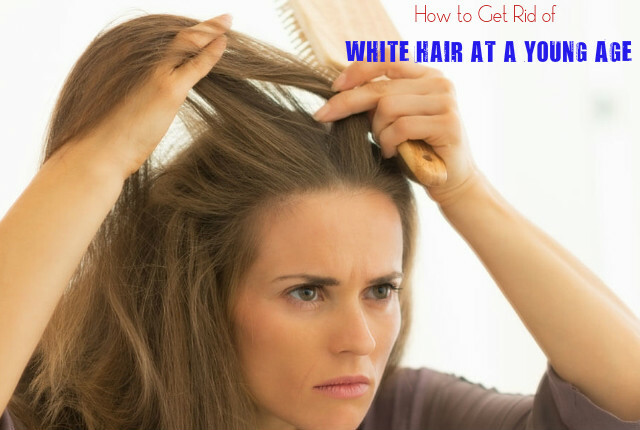 Excessive stress can cause your hair to get white at a young age. So, practice de-stress exercises, meditation and yoga to get relief from stress and prevent hair whitening. Meditation has the power to restore the chemical balance in your brain and helps in making your body and mind calm. Instead of using hair conditioners containing chemicals, try to use natural hair conditioners that can nourish your hair. This helps in promoting hair growth and at the same time prevents hair whitening. You can make a paste of gooseberries and black walnuts and then add natural oils to the paste. This makes a natural homemade hair conditioner. Use this as a hair pack three times a week. This can reverse hair aging and improve the texture and tone of your hair. Your hair becomes stronger and thicker by using this conditioner. It also helps in treating dandruff. Oiling is an important part of your hair care regimen. Most young people are reluctant to use oil on their hair. Avoiding oil on your hair can make the hair follicles weak and this gives rise to thin hair, dull hair and white hair at very young age. You can nourish your hair and scalp by using almond oil and olive oil on your hair. There are also herbal oil formulas available for repairing damage caused to hair. Oiling your hair is one of the best ways to prevent hair whitening at a young age. This helps in preventing as well as curing hair whitening. You scalp can get dry with excessive sweat and heat. As a result, the hair follicles become weak and start aging. This turns hair grey and white. One way o avoid it is to use umbrellas and caps when you go out in the sun. Do not pour hot water on your hair and try to avoid direct heat from blowers that you use to dry your hair. If your hair is already damaged with heat, you can put on cool hair packs to treat the damage. By using these packs regularly, your scalp gets moisturized. Once the normal pH level is attained by the scalp, white hair follicles will get removed. The new hair that grows will be black in colour. Wondering is henna good for hair or not? Well, Henna is a natural dye and has healing properties. Using henna at least once a week can help you prevent hair whitening at young age. It can protect your hair from whitening and also get rid of the appearance of already white hair. Use natural hair dyes instead of hair dyes that you get in the market, which are full of harmful chemicals. Natural hair dyes contain ingredients that can keep your scalp well nourished. To make natural hair dye, all you have to do is to boil tea or coffee for 15 minutes. Let it cool down to room temperature and then add natural oils to this cooled liquid. Your natural hair dye is ready. Washing your hair regularly with this liquid helps in getting rid of white hair. It is also healthy for your hair. Take 4 tablespoons of almond oil and combine t with 1 tablespoon each of lime juice and amla juice. Mix them well and massage your scalp well with a small portion of this mixture. Let it remain on your hair for 45 minutes and then rinse off with cold water, shampoo and conditioner. Take 4 or 5 amla or Indian gooseberry and remove the seeds. Crush the deseeded amla to get a paste. Apply this on your scalp and leave it for 15 to 20 minutes. Wash off with water. Process 1 tablespoon of sesame seeds and 4 tablespoons of almond oil in a food processor. Massage your scalp with this oil mixture for 20 minutes and then wait for another 20 minutes. Wash off with warm water or herbal shampoo. Take a dark coloured glass bottle with a tight lid. Add 4 tablespoons of sesame oil and half a teaspoon of carrot seed essential oil into the bottle and shake well so that the two ingredients mix well. Apply this on your scalp and massage it gently with your finger tips. Wait for about 30 minutes and then wash your hair with a mild shampoo and conditioner using warm water. Various yoga poses can also help you get rid of white hair. Ustrasana, Halasana, Trikonasana, Apanasana, Bhujangasana, Adho mukha svanasana, Matsyasana and Pavanmuktasana are some of the yoga poses for treating white hair.